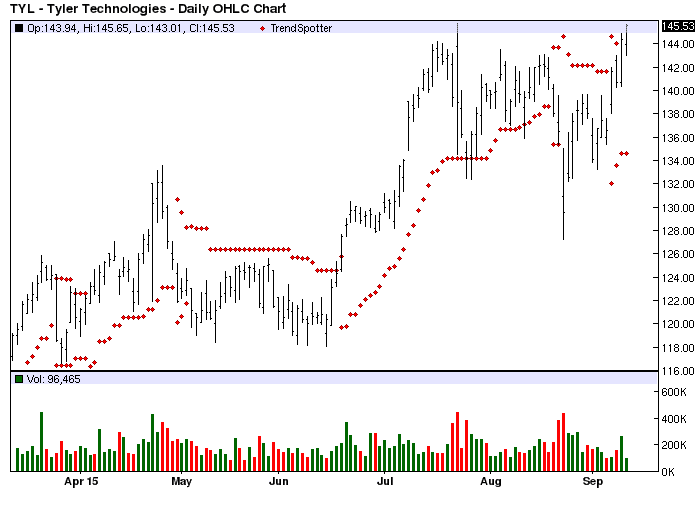 The Chart of the Day belongs to Tyler Technologies (TYL). I found the business software stock by using Barchart to sort the Russell 3000 Index stocks first for the highest technical buy signals then again for a Weighted Alpha of 50.00+. Next I used the Flipchart feature to review the charts. Since the Trend Spotter signaled another buy on 9/8 the stock gained 2.73%. The 20-100 Day MACD Oscillator has been an effective technical trading strategy for this stock.